We meet many people who stumped upon us while searching for the best choice in Highland Springs Tree Removal Company. With well over three decades worth of experience and expertise in the field, we know what it takes to truly get the job done and to the needs of our clients. We focus on offering the best in workmanship and customer service and then the rest just happens naturally in Highland Springs, VA. Taking care of this type of work is extremely important since it does so much for your property. Not only does this impact the look of your home and land but it impacts the safety and well being as well. Too many homeowners have to deal with problems like roots digging up the foundation or insects infesting the property due to finding the ideal home in a forgotten stump. At C.S. Flournoy, our job is to help make sure you don't have to deal with these problems. Our team of highly trained and skilled experts is ready, willing and more than capable of getting the job done for you. Our Tree Removal Company can offer advice or suggestions and take care of whatever task you have on your to do list related to this type of work. Part of what makes us different when it comes to tree removal service providers is the care for which we employ during our work. We focus on quality over quantity while other companies shift their focus the other way. But that's backwards thinking in our opinion. We would rather take on less jobs but make sure each one meets our high standards for completion and that each of our clients is 100% satisfied. Highland Springs Tree Removal work can be tricky because it means taking out a large tree in a precarious spot. Too many untrained and inexperienced companies take big risks in order to get the job done too quickly. Those risks include your fence, porch, shed, fence, car and even house. That is not a risk we are willing to take and you will appreciate the work we invest in completing this job for you in the best way possible. If you have a large tree stump in your yard that needs to be removed, you really only have a few options. 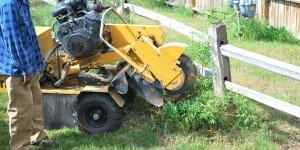 One is to rent a tree stump grinder and try to grind it down yourself. If the stump is large it will be a very difficult and time consuming task because most rented stump grinders cannot handle such large tree stumps. Most likely you will need to hire the services of a professional Highland Springs Stump Grinding contractor. C.S. Flournoy has the heavy duty equipment and tools needed to handle grinding down any size tree stump. Give us a call today for a free estimate on tree stump grinding and removal services. You have no excuse for settling for less than the best when it comes to getting this type of work completed. Now that you know who to call on for your Highland Springs Tree Trimming work. We take great pride in the work that we do and it shows in the results we get. Let us show you how we earned the number one title we have. "Danny Epps' crew went above and beyond my expectations when a massive oak tree came down on my property. They even addressed fencing and landscaping concerns, which were not technically part of the scope of work. CS Flournoy will continue to get my business the next time Mother Nature decided to rearrange one of my properties!" "The promptness of responses, courtesy of everyone from the office to the crew, and the cooperation in working with us for some requests we made that did not make your job easier was fantastic! While it was difficult to make the decision to have our 3 trees removed, your professionalism and friendliness contributed to a less traumatic experience. Thank you so much!" "I just purchased this house and part of the insurance agreement was, I would have limbs removed that were touching the roof of the house. There were about 8 limbs off a large 60 year old pine tree with each limb in between 3 and 6 inches, they were fairly hefty in size. C.S. Flournoy had another estimate cancel, and called to see I could meet him early. The estimator showed up right when he said he would and knew his stuff. I got several estimates and his was the most professional and the cheapest. It was a small job, but that didn't seem to change my priority level. They did a wonderful job!" If you are looking for a Highland Springs Tree Removal Company then please call 804-264-1000 or complete our online request form.